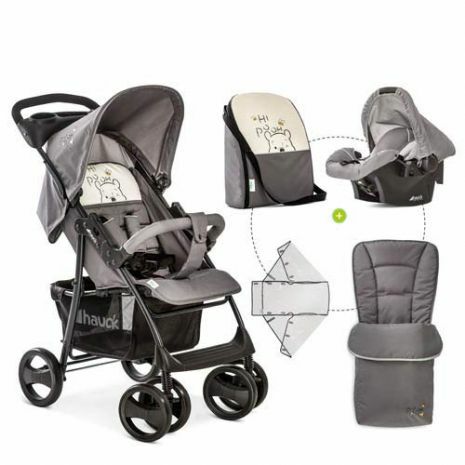 The Shopper SLX Shop'n Drive Set consists of car seat, foot muff changing bag and raincover. You are well equipped for your trips. This Shopper also performs great on buses and trains.Due to its lightness, its robust frame and its large wheels you will master uneven grounds playfully. The suspension absorbs shocks gently. The locking brake, the 5-point harness and the detachable front bar offer optimum safety. The baby bottle is always ready to hand in the practical cup holder on the push handle. The extra large basket offers ample storage space for baby items. For your newborn, use the car seat Zero Plus 0+. This comfortable car seat guarantees optimum safety on every ride thanks to its innovative side impact protection system with patented use of shock-absorbing PU Foam and the padded 3-point belt. Combine the Zero Plus 0+ with the chassis to form the practical Shop'n Drive Travel System. This is ideal for shopping as you do not have to wake your child up when you take the seat out of the car.